One of my favorite parts of the holidays is that they give me an excuse to take my 4-year-old to our local craft store so we can stock up on the supplies we need to transform our home into a holiday-inspired wonderland. There’s just something so incredibly wonderful about surrounding myself with decorations made by my sweet bear, and I love watching the excitement mount in her eyes as we make different masterpieces to show off to her grandparents and aunts and uncles on the big day. Now, one thing you’ve probably figured out about me is that, while I love to do fun things with my daughter, I am absolutely terrible at coming up with my own ideas. And I may or may not have decorated our dining table with this turkey centerpiece one year. The good news is that the wonderful world of Pinterest has offered me so many amazing options since that embarrassing experience, and after spending an hour or so searching through all of the awesome DIY Thanksgiving decorations for kids other people have perfected, I have so many amazing Thanksgiving-inspired boredom busters to keep my daughter and I occupied on cold weather days when it’s too miserable to walk to our local Starbucks for my pumpkin fix. Here are 25 of my faves. 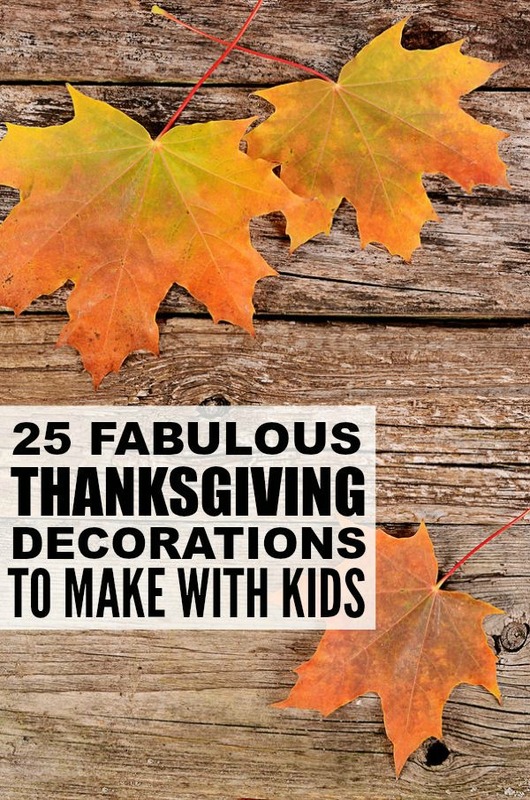 If you liked these DIY Thanksgiving decorations for kids, please share them on Pinterest! And if you’re looking for more ways to have fun with your kids, please follow our Kids board on Pinterest where we share all kinds of fantastic arts, crafts, and activities to keep you and your little ones entertained!